Recently, sampling (convolution) reverbs have become more and more in demand. With convolution, we have an opportunity to capture the sound of anything in the world that can generate a reverb and use these sound impulses freely in any situation imaginable. This enables us to use the sound of high-end reverb units, real-world rooms, halls, cathedrals, synthetic reverbs and other sources, including non-reverb ones, without any hassle and in a uniform way using only a single program or a plug-in module. Although there are many different sources of impulse responses, we also face the difficulties of acquiring these so they can be used seamlessly in any software environment. In many cases during some stage of the impulse capture, we typically have a rather large set of recorded test tones that were run through some device or mic'ed in some room. This poses the difficulty of recovering the impulses conveniently and with minimal user effort. The other problem we may face is the input or the output bit-depth incompatibility of the recorded and the recovered files. Some convolution plug-ins tend to support only a small subset of available bit-depths. And alike, existing deconvolution programs and plug-ins support only the given sample rates and bit depths, and tend to offer a very poor quality deconvolution. Voxengo Deconvolver overcomes these problems. First of all, it supports almost all sample formats (bit-depths) of uncompressed mono/stereo WAV files. Secondly, it offers a very convenient environment in which to deconvolve large sets of recorded files. Voxengo Deconvolver also offers a true mathematical FFT deconvolution which delivers 100% exact deconvolution. 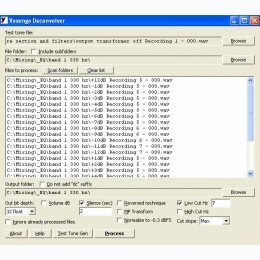 At the same time, this puts a huge demand on the system memory: deconvolving a 25-second stereo file at 96 kHz may require up to 100 MB of memory.